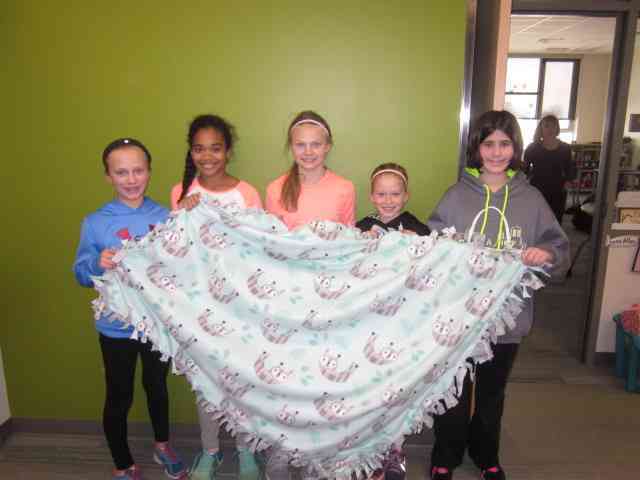 Our goal is to provide a tie-blanket and a book for each first grader at Westside Elementary School in Sun Prairie. Westside is a community school that relies on help from its neighborhoods to help make a difference in the lives of several children that have families that may struggle from time to time. We’d like to remind and share with these first graders the joy found in reading; especially when snuggling into a comfy blanket. Each fifth grade homeroom will be making seven or eight tie blankets. This will allow each of the 97 first grade students at Westside to have his/her own blanket and at least one book. We will work in homerooms to make the blankets, but we need some help in purchasing material for the blankets. It costs about $15 to make one 4 x 6 tie-blanket as well as provide at least one book for each student.